Leading finance leaders around the world and in many disparate industries are winning at automation. In fact, it is the very adoption of automation that is defining many as leaders. Far from viewing automation as a negative, reductive force, successful finance leaders are recognizing that automation really can deliver on its promise— especially when it’s intelligent automation and when it’s applied to finance and accounting (F&A). Emerging new technologies bring new levels of agility to F&A, which has often had an uneasy relationship with IT over the years. At their most effective, these are tech tools that aren’t simply applied to existing business models, but that are part of a bigger and broader reassessment of how processes can themselves change. In short, F&A teams can reimagine their futures. If they are bold, if they approach automation constructively, if they use its introduction as an opportunity to reassess current practices, they’ll deliver more to their organizations than anyone hitherto thought possible. F&A teams have been expected to deliver increased value for a number of years. It’s been measured largely in terms of operational efficiency, and the benefits have been administrative. But more recently the nature of this challenge has changed. Value is now seen not just as cost-based but as part of organizations’ wider commitment to the people they serve. It’s not just an internal function, but outward looking. It’s about increasing cost-effectiveness and so maintaining competitiveness and meeting commitments to shareholders—but it’s also about enabling businesses to understand their performance from moment to moment, and to put plans in place that improve that performance not just for themselves but for their current and future customers. In short, the F&A function is now expected to run the business efficiently—but also to help the sales team sell, the marketing team to shape the offer, the supply chain to work cohesively and the logistics function to deliver. Business functions can be automated to meet these challenges, but intelligent automation goes a stage further. It learns. It takes the initiative when it can, and provides a basis for expert decision-making when it can’t. That’s why artificial intelligence (AI) is set to extend and transform the contribution F&A makes to organizations, by benchmarking operations to ensure top performance, reducing total cost of service and implementing a target operating model that actively supports the business. Enhance customer experience (CX) by moving customers even closer to the center of service delivery. Improve relationships with and value for business stakeholders. Improve controls across standard processes. Boost P&L and cash flow by reducing leakage from order-to-cash. Enhance management of effective working capital. Increase sustainable growth in new and emerging markets. To take full advantage of intelligent automation, what’s needed is a change of mindset, and in a number of ways. To begin with, it means F&A teams need to see the direction of travel in which this new approach is taking them. For instance: their role will continue to involve reducing cost of service and cost will continue to be a default metric. But for one thing, it’s no longer just F&A costs that are under consideration (the cost of processing an invoice, for example): properly handled, intelligent automation can deliver cost benefits throughout the organization. And for another thing, cost is itself only part of the story—as we shall see, intelligent automation gives F&A teams a role to play in delivering great customer experience. The change of mindset also includes accepting that this is not a purely a technology proposition, and that AI can’t simply be bolted on to current processes. Like human intelligence, it’s a combination of knowledge, senses and experience, and realizing its potential involves thinking not just about the digital elements, but also about the business infrastructure within which they operate. Properly implemented, AI ought to be intrinsic to the way the enterprise functions. At Capgemini, we have identified five main attributes of intelligent automation and smart processes that they can be likened to human senses. Thinking of them in this way makes it easier to understand how they function and the contribution they make. Interactivity is the area in which the technology most engages with people, listening to them, reading what they say and responding, either aloud or in writing. Chatbots and voicebots are common examples. For instance, an intelligent service desk can help F&A team members resolve their own “How do I do this?” queries. But the technology could also convert data into forms people can understand. It can interpret and present information and even summarize it to assist F&A teams with decision making. Intelligent automation makes continuous monitoring possible. It means F&A teams don’t have to wait until month-end to see the state of play. It also means they can keep an eye on gaps in transactions and not only see and rectify them quickly but develop new controls to mitigate against future instances. In these instances we see automation taking action on its own initiative. In F&A, robotic process automation (RPA) is an example of this, taking and processing a customer order or processing a supplier invoice. AI can extend RPA by employing deep learning algorithms to learn from historical data and decide appropriate processes and approaches to take in the delivery of financial and other services. AI detects patterns, recognizes trends and applies algorithms to information to determine appropriate actions—and it can do this at scale. This can help F&A teams not only identify opportunities to improve their standard practices but make recommendations to other parts of the organization. For example, transaction history may indicate demographic differences in payment preference that the F&A team can pass on so processes can be amended to improve customer experience. AI turns knowledge management on its head. Instead of being driven by the data and by the systems in which it resides, it’s driven by the needs of the business and by the value it brings in shaping future direction. AI-based knowledge platforms can employ deep learning techniques, text analytics and neuro-linguistic programming (NLP), advanced analytics, and knowledge extraction algorithms. For instance, a “fraud bot” can be trained to spot suspicious activity that might otherwise be missed—activity such as changes to bank details, misspellings and transactions at strange times of day. Capgemini’s Business Services is a global operation, serving multinational organizations across a range of markets and sectors. Streamline operations and increase efficiency. Extrapolate more information from financial data, and interpret it more effectively. Improve insight and determine improved courses of action that benefit customers and the organization itself. Assess current business processes to determine best technology approach. Adapt processes or technology or both to achieve best results. Implement automated approach using a suite of hand-picked best-in-class tools, not just at process level but for the benefit of the organization as a whole. TALK/LISTEN/Interact—customers, vendors, and employees to resolve queries and improve collections. WATCH/Monitor—cash, collection contacts, ageing and customer disputes and more besides using KPI dashboards. ACT/Service—automated cash apps, bank reconciliations, sales invoice creation, T&E claims processing and more, plus exceptions handling and e-invoicing. THINK/Analyze—P&L, cash, procurement spend, collections and process efficiency, transaction costs and more. REMEMBER/Knowledge—collection strategies and patterns as well as cash application and bank reconciliations rules. 10-day reduction in days sales outstanding (DSO). 30% productivity increase in P2P (T&E and accounts payable). Approximately 80-FTE reduction in 2016 (10% of overall headcount). 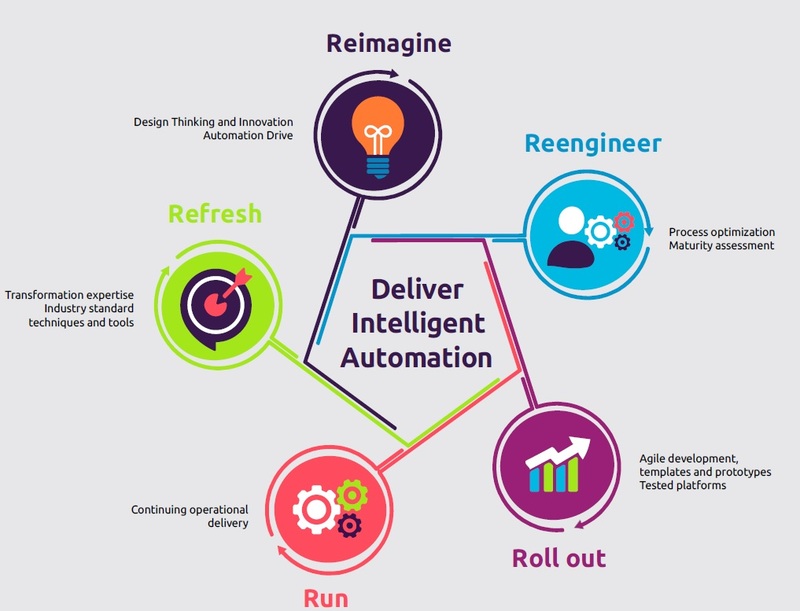 Automation Drive is Capgemini’s consolidated approach to intelligent automation that combines machine power with business vision, enabling new ways to innovate and turn intelligent automation and AI into an engine for business growth. The Automation Drive suite Capgemini brings to F&A and other enterprise disciplines comprises three components—Automation Drive Framework, Automation Drive Tools and IP, and Automation Drive Services. Reduced effort per request from 3–4 days to 2–3 hours. 6-day reduction in dispute resolution time. Gives finance teams a more comprehensive and immediate view of business performance than they’ve ever had before. This knowledge is a benefit not only for F&A but for every other part of the organization. Brings new and more immediate levels of measurability to finance. Is more accountable. By automating F&A processes organizations can also to a large extent automate demonstrations of their compliance. Demonstrates that good customer experience can and should be part of the F&A remit, and also that it’s not necessarily predicated on people. In fact, it can monitor activity and respond appropriately in ways that couldn’t otherwise be achieved. What’s more, a fairly low investment can deliver a significant return, which can then fund further transformation. The transformative benefits of intelligent automation can be achieved to their fullest extent when things work in concert with one another—when technology and tools are matched by deep understanding and experience not only of their implementation, but also of the processes to which they apply inside global operations. When this happens the F&A function will be recognized as the nerve center of the enterprise, and the entire organization can reimagine its own future.